In last month's Neurology Today, US Surgeon General Richard Carmona, MD, and others spoke about poor health literacy and its limiting effects on patient comprehension and patient education. Although we acknowledge the importance of instructing and informing our patients properly, we are faced with the realities of busy neurology practices and an increasing time crunch. Under these circumstances, how can we afford to spend this extra time with each patient? 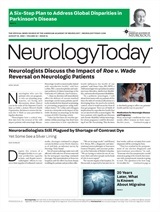 “Five years ago, following an AAN needs assessment survey, it became clear that neurologists were looking for better ways to help educate their patients,” said Robin L. Brey, MD, Section Editor of the “Patient Page” in Neurology, and Professor of Neurology at the University of Texas Health Sciences Center in San Antonio. “The AAN has been working to provide resources to address this request since that time,” she added. “We need to provide good information to educate our patients. It is a challenge that takes time, but in the long run, it is a time-saver, reducing call-backs and improving compliance. It's also just good medicine and decreases the chance for errors and lawsuits,” she advised. Just how does poor communication factor into the issue of medico-legal risk? Last summer, the Physician Insurers Association of America (PIAA) Data Sharing Project conducted a survey of neurology claims dating back to 1990 and resolved between 1998 and 2003. The study focused on 300 paid cases that specifically involved neurology patients, as reported by 24 PIAA member companies. In the physician's office, communication issues either between providers or provider and patient were the second most frequent issue reported. About one-third of the alleged injuries that arose in the physician's office resulted from medication errors – either wrong prescription, over-prescription, medication that was contraindicated with other medications the patient was already taking, or medication abruptly discontinued. The Patient Page, www.neurology.org, was introduced in Neurology in July 2002, and it comes out online on a monthly basis. Page 1 consists of an editorial condensation of an article from the same month's issue of Neurology and is written in lay language. Page 2 consists of a fact sheet on the condition described including diagnosis, causes, and treatments, and provides links to relevant organizations for more information. The Brain Matters Web site, www.thebrainmatters.org, was introduced in November 2003 and developed in collaboration with patient advocacy groups. Each neurological disorder is discussed in terms of symptoms, causes, diagnosis, treatments, current research, and prevention. Each section also includes a patient story that is presented from a positive viewpoint. Patient Education Brochures about a variety of disease states and Patient Guidelines (migraine and dementia) are available print resources and are being updated for release at www.aan.com/professionals/patient/patient_edu.cfm. Quality of Life Guides, a new patient education book series, are being developed by the AAN Press in partnership with Demos Medical Publishing, covering an array of diseases and ailments that affect the brain and central nervous system. Written by neurologists and other experts in these fields, the books will provide a detailed discussion of each disorder, its causes, and the course it may follow, as well as answer a number of questions faced by patients and their families. The first, a headache guide, Migraine and Other Headaches by William B. Young, MD, Assistant Professor of Neurology and Director of the Inpatient Program at the Jefferson Headache Center at Thomas Jefferson University in Philadelphia, PA, and Stephen D. Silberstein, MD, Director of the Jefferson Headache Center, is now available (See Sidebar, “New AAN Migraine Book for Patients”). Alan M. Rapoport, MD, Director of the New England Center for Headache in Stamford, CT, said his group began writing their own pamphlets to hand out to patients and consolidated them into a book, Conquering Headache, which is currently in its 5th edition. “Patients are given the book to read prior to their departure from the office and they are directed to specific topics,” he said. “This allows for a more well-informed discussion with the patient at the subsequent encounter. “We tell each patient what we believe to be their correct diagnosis and we discuss treatment options,” Dr. Rapoport added. “We then inform them that a comprehensive discussion is included in the book and ask them to consider if our conclusions appear to be valid. “We also give the patients calendars in which our nurses write instructions for scheduling medication and ask patients to document their usage accordingly. This way we can see if they have understood and if they are taking medication the right way,” he noted. Abraham N. Lieberman, MD, a practicing neurologist for 30 years and Medical Director of the National Parkinson Foundation, has written several books, including Shaking Up Parkinson Disease and 100 Questions and Answers About Parkinson Disease. “An informed patient is better able to ask good questions and to recognize problems,” he said. Dr. Lieberman also receives 20 to 40 questions every day from readers and estimates that he devotes three hours per day answering questions for the “Ask the Doctor” section of the Web site, www.parkinson.org. Other good sources for patient education are offered through Web sites maintained by the Parkinson's Disease Foundation at and the American Parkinson Disease Foundation – www.apdaparkinson.com – and the Parkinson's Disease Foundation at www.pdf.org. Some neurologists have turned to the radio airwaves to improve public awareness of neurological care. “Radio, in my opinion, is a vastly underutilized medium for public education on health care matters,” said Steven M. Lomazow, MD, who practices neurology in Belleville, NJ, and serves as host for Real Medicine Radio on WOR710, on in the metropolitan New York area on Sunday mornings at 11 AM. The role of other media programs is also being closely evaluated. Larry B. Goldstein, MD, Director of the Duke Center for Cerebrovascular Disease and Head of the Stroke Policy program at the Center for Clinical Health Policy Research at Duke University in Durham, NC, believes that a sustained multilevel campaign incorporating a variety of techniques will be required in order to succeed in increasing stroke awareness. Dr. Goldstein believes that to improve stroke prevention and care, a multimedia strategy coupled with changes in the stroke health care infrastructure and provider education will be required. Of course, the office encounter remains the cornerstone of communication between neurologist and patient. Nothing can replace the moment in which the doctor and patient (or family member) come to terms with each other in negotiations over diagnosis, prognosis, and treatment. At this point, the neurologist must determine whether there exists sufficient understanding to keep the patient on track with respect to continuing management. Often this requires questioning the patient or family member directly or, as described in last month's column, even asking that they repeat the opinions and instructions back in their own words. It is only after successful completion of such communication that the patient or family will be able to effectively incorporate and use supplementary written or oral information. Migraine and Other Headaches is comprehensive in scope, beginning with an overview of the history and general concepts of headache and what patients should expect when they visit their physician, to detailed discussion of the triggers for migraine, primary and secondary-type headaches, research, and treatment options.